You might not know about ActionTec, but you may have their products in your home. They are the leading provider of routers and switches to 3rd party companies. Now they are coming to the consumers with a great product that gives you 1080p wirelessly within 150 feet. ActionTec announced a new line of HDMI products using the Cavium PureVu processor that allow you to push video across a wireless signal. Not only video, but full 1080p video. This can push even a 3D signal across the air to your TV with HDCP 2.0 Encryption. No wires to bury in walls, still have a great picture. 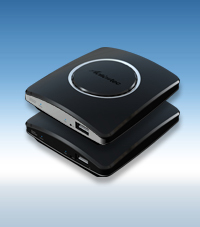 Now you won’t need to have a Set Top Box or Blu-Ray player next to a TV. ActionTec HDMI Adaptor will be available soon for $200. You will get one transmitter and one receiver.